You are currently browsing the tag archive for the ‘Sword of Truth’ tag. The Pillars of Creation is the eighth book in the Sword of Truth series, assuming you also count the prequel novella Debt of Bones. The previous novels, Wizard’s First Rule, Stone of Tears, Blood of the Fold, Temple of the Winds, Soul of the Fire and Faith of the Fallen, have been reviewed at ASif! previously. Although this novel arrives late in a long series (both in terms of the number of books and the length of each), it is a good entry to the series for new readers. It isn’t by any means a reboot, but Goodkind spends most of the novel introducing a character who has had no involvement with the events of earlier novels. A new reader would need no background information at all to be able to read and enjoy this novel. Mind you, if halfway through the novel you asked a new reader and someone who’d read the entire series what was going on, you’d get two very different answers. That’s not a bad thing – it simply means the interpretation of some events would be different with different knowledge. And that’s one of the points Goodkind is making in the novel. The Pillars of Creation introduces Jennsen, a young woman who has spent most of her life on the run with her mother, hiding from the father who wants to kill her. Jennsen doesn’t know why Darken Rahl wants to kill her, only that he does, and that he’s ruthless. Jennsen has strong survival skills when it comes to physical challenges such as fighting, living off the country, or running; but having spent much of her life isolated from people, her skills aren’t so finely honed when it comes to judging people or their motivations. Faith of the Fallen is the seventh book in the Sword of Truth series, assuming you also count the prequel novella Debt of Bones. The previous novels, Wizard’s First Rule, Stone of Tears, Blood of the Fold, Temple of the Winds and Soul of the Fire, have been reviewed here. 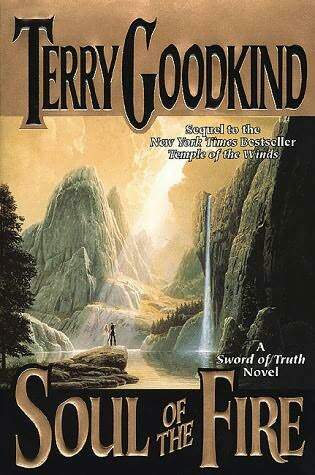 Throughout the Sword of Truth series, Goodkind has tried to write novels that do two things at once: present a complete and enjoyable story, and also advance the story arc of an overarching plot that runs through the series. Initially, Faith of the Fallen looks as though it may meet the first criteria, but not the second. However, late in the novel it becomes clear that Goodkind has indeed made some significant moves in regard to the bigger story. Soul of the Fire is the fifth book in the Sword of Truth series. It’s preceded by Wizard’s First Rule, Stone of Tears, Blood of the Fold, Temple of the Winds, and the prequel novella Debt of Bones. 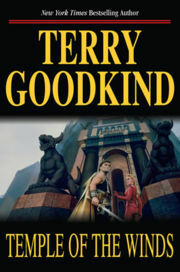 As with the earlier novels, Goodkind has sought to tell a stand-alone story which still contributes to a larger story arc that runs through the series. Unfortunately, he’s been less successful with Soul of the Fire than with earlier novels. This is still an enjoyable novel, it’s just not as effective in some regards as its predecessors. In essence, the major problem with this novel is that it feels more like an instalment, a place holder, than the other novels have done. The overall story arc barely advances; the stand-alone story is rather weak; and new readers would have some trouble engaging with either the characters or the overall story. Temple of the Winds is the fourth in the Sword of Truth series, preceded by Blood of the Fold, Wizard’s First Rule, and Stone of Tears, and the prequel novella Debt of Bones. Previous reviews of these books can be found here. 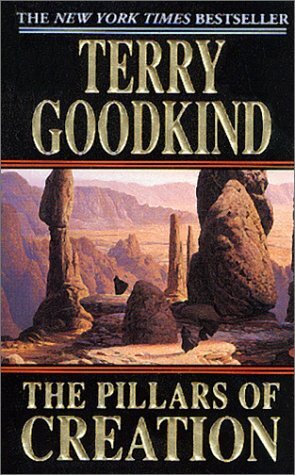 As with earlier novels in the series, Goodkind appears to have made an effort to ensure this novel is sufficiently self-contained to be able to be read by those new to the series. He’s been less successful than with earlier books; to a large extent this is due to the sheer weight of both the character development and the overarching plot of the series, both of which are well advanced by this point. He’s engaged in some recapping in the early chapters of this novel, which he generally hasn’t done before, but even so, new readers are likely to have some trouble with aspects of the novel. For ongoing readers, however, this strategy continues to work well. The partially self contained plot means that you get some closure and a sense of achievement with each novel, rather than having to get through three or more novels to reach a payoff.